With the introduction of Dynamics 365 for Finance and Operations came the workspaces. Relative to the role centers that we knew back when using Dynamics AX 2012, workspaces are really amazing. They allow for role- or task-based quick insight in the most important information and quick access to actions. The ability to include Power BI analytics or, from the Spring (July 2017) release onwards, having full embedded Power BI capabilities, is the cherry on the cake for me. From the get-go, standard workspaces have been made available and during the releases following the initial RTW release quite some workspaces have been added. For instance, with the Spring (July 2017) release, some really helpful workspaces have been added. Read my blog on New workspaces available from the Dynamics 365 for Operations Spring (July 2017) release. Users can also create their own workspaces for specific tasks or roles in whatever way the like. 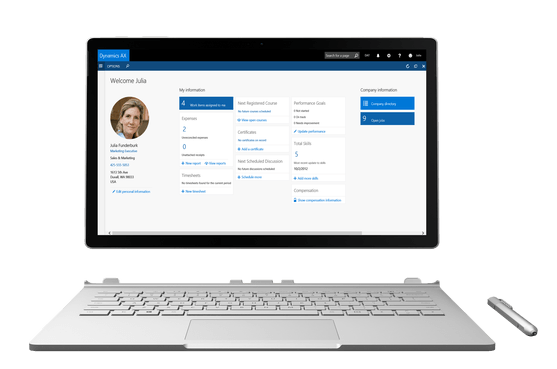 They can add tiles, lists, and links from basically anywhere within Dynamics 365 for Operations. Just navigate to a specific page, set query’s or advanced filters in a way that the information displayed is relevant for you and click ‘add to workspace’ from the Options tab. This allows for users to bring all of their required information with their exact filters into a single dashboard and can ultimately improve user productiveness hugely. But, knowing that the vision from Microsoft is to rely less on standard workspaces and focus on organizations and users creating their own tailormade workspaces, there really is a lack of functionality to allow for management and distribution of workspaces, or personalization in general. Yes, you can export and import workspaces, so you can share them with you co-workers, but you would be a) braching off from that point onwards and b) you would be sending over xml-files to share them across users. This is very hare to manage with large groups of users. That said, know that importing does not always work that well. Based on my experience, I’ve seen that parts of the workspace are not generated when importing, rendering the workspace less usable and users having to do re-work to recreate parts of the workspace. That all seems like the stuff you can overcome, or we can rely on that it will be improved in future releases. However, when I’m talking aligning with the vision to rely less on standard workspaces and focus on organizations and users creating their own tailormade workspaces, I’m talking about more. I’d like to see workspaces optionally to be upgraded from a user-level to usergroup level, or even an organization level. How would that look like? Well, we’d start by creating a workspace once, for instance by a single power user or during the implementation project, and then be able to share the workspace in a push-matter (instead of the current branch-and-pull-model) to multiple users or a group of users within the organization. Changes or improvements to the workspace would also be managed centrally and pushed to the other users, since basically they are all using the same workspace. Please read the following submission to ideas.microsoft.com and vote if you agree: https://ideas.dynamics.com/ideas/dynamics-operations/ID0001306. The idea is more broader for all personalization, but I’ve appended the existing idea with my focus on workspaces specifically and ideas on integrating this with Lifecycle Services. In addition, this is also valid for workspaces. It would be a very valueable addition if you are able to publish a workspace to a group of users and be able to maintain it centrally. In the most ideal situation this is (optionally) integrated with Lifecycle Services. In my vision you should be able to define user group profiles and be able to link them to (parts of) processes in the Lifecycle Services BPM. For these group profiles you should then be able to apply shared personalization and enable (centrally managed) workspaces. This all with respect to the options to disable personalization in a whole or only allowing explicit personalization.